DMCC committed to the UN Global Compact in August 2017 to encourage responsible business practice throughout the entire value chain ranging from its world-leading DMCC Free Zone. 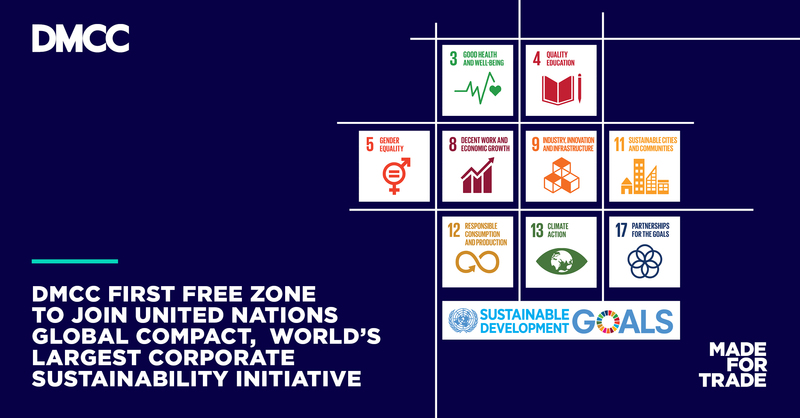 DMCC, the world’s leading Free Zone for commodities trade and enterprise in Dubai, announced today it is the first Free Zone in the UAE to commit to the world’s largest corporate sustainability initiative, the UN Global Compact. Founded in 2000, the UN Global Compact is a United Nations initiative to encourage businesses worldwide to adopt sustainable and socially responsible policies, and to report on their implementation and progress. DMCC committed to the UN Global Compact in August 2017 to encourage responsible business practice throughout the entire value chain ranging from its world-leading DMCC Free Zone, home to over 14,100 companies; its Jumeirah Lakes Towers District with over 92,500 people; to its unique property developments including the much anticipated Uptown Dubai; through to its trade facilitation for key commodities sectors such as precious metals, diamonds, tea, coffee, and the food and agri trade. In brief, DMCC is to make a positive impact in delivering to Global Compact’s sustainability goals through its people, partners, member companies, and the community at large by raising awareness and by encouraging companies to transform their business models to serve societal needs, contributing to a more inclusive and sustainable marketplace long-term. “We applaud DMCC’s leadership in prioritizing sustainability in their marketplace. DMCC is the first of all free zones throughout the UAE, to become signatures of the UN Global Compact United Arab Emirates Network. Through this leadership, they are setting a precedent throughout the country on the sustainability agenda. My hope is that this partnership will foster a community of business embracing sustainability, which is in aligned with the UAE’s 2021 Vision”, said Mr. Mahmoud Hesham El Burai, the United Nations Global Compact United Arab Emirates Network Representative. The DMCC and UN Global Compact partnership announcement follows a series of meetings between the two entities. In September this year, Ahmed Bin Sulayem, DMCC’s Executive Chairman, and Gautam Sashittal, DMCC’s Chief Executive Officer, attended the UN Global Compact CEO roundtable and the UN Private Sector Forum in New York. “Working with Global Compact will allow DMCC as the first ever Free Zone to foster sustainable growth by delivering to the UN’s sustainable development goals on a national and international scale. In line with our robust regulatory platforms and work to support producing nations such as Africa, DMCC believes that Corporate Social Responsibility is critical in making the future of trade better and an obligation for all of us”, said Ahmed Bin Sulayem, Executive Chairman, DMCC. Earlier this month, Sir Mark Moody-Stuart, Vice Chairman of the Global Compact, addressed an audience of over 350 global diamond experts on the importance of the Global Compact at DMCC’s Dubai Diamond Conference: “I commend the global – or the local networks of the UN Global Compact to you. I believe they are the future of the Compact because they bring small businesses, big businesses, international, national businesses, local civil society, trade unions if they are there together to work on the priorities of that particular country…the UNGC has 10,000 members in over 160 countries and if we can unite in those local networks focused on local priorities working with others, we can actually make a big change and I think those networks are a useful source of information on local supply chains”, Sir Mark concluded.